Applying Patyka's Anti-blemish Toner is the final step of the CLEAN double-cleansing method (cleansing oil + cleansing foam). Inspired by the layering method, the CLEAN ritual deeply cleanses for a radiant and smooth skin. This organic purifying lotion removes all impurities and excess sebum : imperfections are reduced and pores are tightened. Thanks to its prebiotics and natural antibacterial ingredients, it rebalances and refines the skin for a healthier complexion. Great for combination to oily skin, its fresh and light texture helps to rebalance and smooth the skin. Organic purifying toner for combination or oily skin. 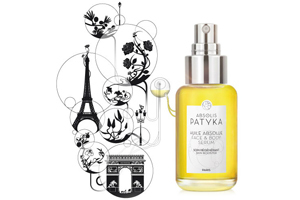 After double cleansing, gently massage a few drops of Patyka anti-blemish toner with a cotton pad or with fingertips.